Gekko is a tool that makes it very easy to automate your own trading stragies. Backtest: You can start a simulation of the strategy over a historical data period and Gekko will tell you what would have happened (which trades would have been performed as well as overall performance and risk metrics). 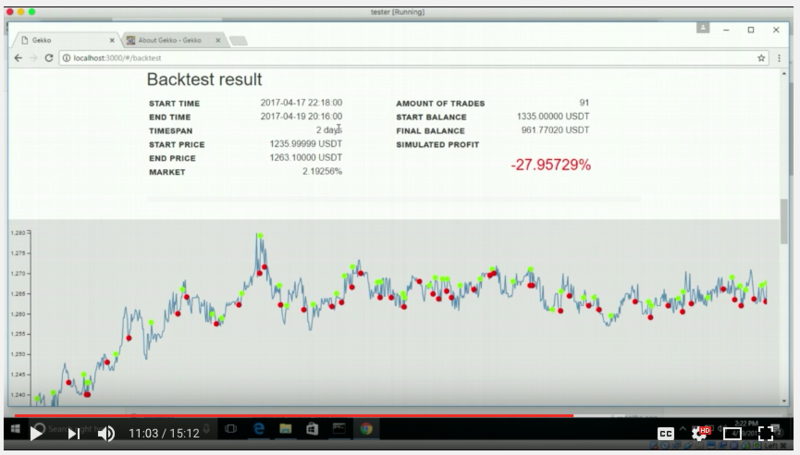 Paper trader: You can run the strategy in realtime simulate trading (trade with fake money) to see in realtime how profitable your strategy would have been. Tradebot: You can run the strategy in realtime and automatically execute orders based on the signals. All the above modes can be run from the user interface, this interface will show charts and performance/risk statistics. 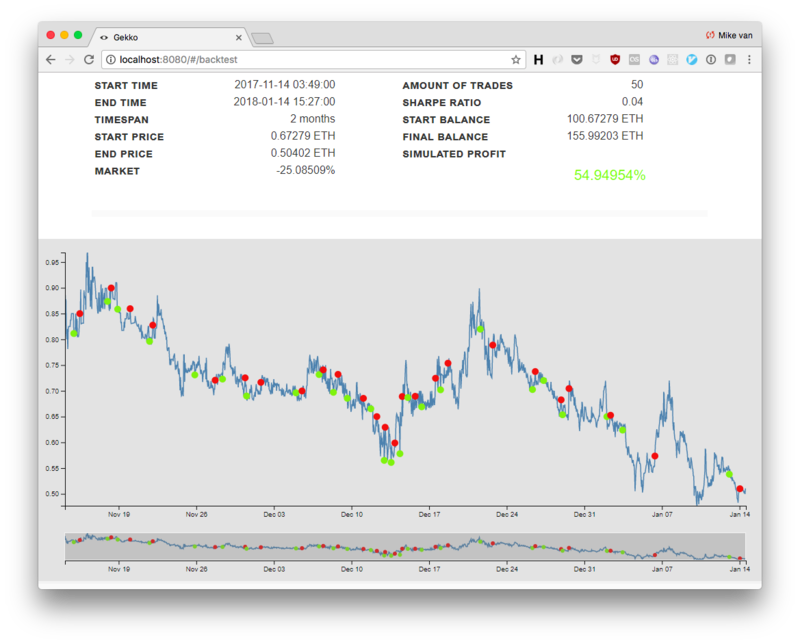 Gekko can watch the realtime markets, automatically excecuting and evaluating your strategies in the process. Whilst doing this Gekko will store all market data it sees, this makes it possible to later simulate trading strategies against historical data to see whether they would have been profitable (backtesting). Windows user? Please see the doc installing Gekko on windows instead. Docker user? You can run Gekko in a docker container, see installing Gekko using Docker instead. Server user? In order to run Gekko headless, see installing Gekko on a server instead. Gekko requires nodejs to be installed. Go ahead and install this if it’s not already (Gekko requires at least version 6). We advice to download the current LTS. This will download the latest stable version of Gekko, remove the final -b stable part to download the current latest release (which might not be as stable). Alternatively you can manually download the latest stable version of Gekko on the releases page. If you downloaded the zip you can just download the new version. If you want to move historical data over (for backtesting purposes), copy the contents of the history folder found inside the gekko folder. If you have written your own strategies, don’t forget to move them over as well.